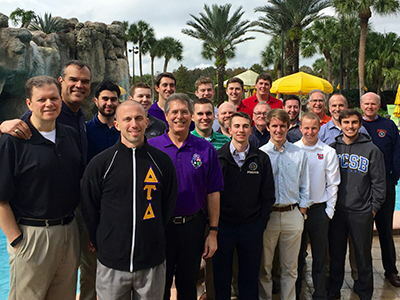 Meeting Jan. 8-9 at the Hyatt Grand Cypress, site of the 2016 Orlando Karnea, the Arch Chapter of Delta Tau Delta enacted a policy on nondiscrimination, committed to a plan to better support frontline volunteers and accepted a chartering petition to what will soon be the Kappa Epsilon Chapter at The College of New Jersey. International President Jody Danneman (University of Georgia, 1988) views this action as a strong commitment to a diverse Delt membership. Enactment of a Volunteer Services Improvement Plan came after several months of research and analysis aimed at better support for the Fraternity’s frontline volunteers. Its key points are based on recommendations made by Tobi Johnson and Associates, a consulting firm with significant experience in non-profit organizations. The plan calls for a three-year rollout beginning immediately. In related action, the Arch Chapter approved new job descriptions for division vice presidents, chapter advisors and volunteers serving as conduct investigators for alumni supervisory committees. The College of New Jersey Crescent Colony was formed in fall 2014 and includes 91 men with an aggregate grade point average of 3.06. The chartering ceremony is tentatively scheduled for March 5 at the campus in Ewing, N.J. The new group will join Rho at Stevens Institute and Kappa Gamma at Monmouth University as Delt chapters in New Jersey. Determined dues for undergraduate members will remain the same in 2016-17 as in 2015-16. Those are: $85 for new members at the time of pledging, $130 for annual dues and $305 for the initiation fee. The latter fee also includes first-year dues. Suspended the charter of the Gamma Alpha Chapter at the University of Chicago. Conducted the annual review of the Fraternity’s campus expansion list and more specifically, the Fast Track Expansion List for those campuses most targeted for colonization efforts. The Fraternity Board of Directors, representatives of the accounting firm of BKD and Audit Committee Chairman Charlie Johnson (University of Southern Mississippi, 1993) reviewed via conference call the Fraternity’s annual required Form 990 filing for FYE 7/31/15 to the Internal Revenue Service. BKD reported no significant changes from the previous filing for FYE 7/31/14. Chairman Johnson also disclosed the annual audit conducted by BKD resulted in a clean report. Received a report from Ken Kies (Ohio University, 1974), chairman of the Delta Tau Delta Educational Foundation, on the status of the Fisher-Nichols Memorial Headquarters which houses the Fraternity’s business operations in Fishers, Ind. The creation of an ad hoc committee for member discipline review. An updated whistleblower policy to bring Delta Tau Delta into compliance with new requirements of New York state law. Delta Tau Delta Fraternity was incorporated in New York and continues to be subject to its corporate law requirements. Reviewed a report from the Alumni Achievement Award Committee chaired by Carl Brantley (Georgia Southern University, 1975) and approved additional alumni to be added to the list who will be invited to receive the award. Continue active ASCs until the next Arch Chapter review during its August 2016 meeting at Boston University, Case Western Reserve University, Hillsdale College, Stevens Institute, Tulane University, University of Kansas and University of Oregon. Dissolve immediately the active ASCs at the University of Pittsburgh, Sam Houston State University, Texas A&M University and the University of Washington. Appoint an ASC at Texas State University.